Not too long ago, I was providing technical assistance to a staff member at a local health department whose agency was not open to letting her use certain social media tools to engage with their community. I asked my Twitter network for ideas on resources that might help her make the case with a reluctant organization. Dawn Crawford, who is the Communications Director at the Colorado Children’s Immunization Coalition (@ImmunizeCOKids on Twitter) very generously offered to share what she had learned, having been in a similar situation. After she emailed me the information to pass along, I asked her if I could repost it on my blog because it was full of pearls of wisdom that I thought would be useful to others, no matter what type of organization you work for. She wrote it up as a guest post here. Thanks so much, Dawn! So you want to convince the boss to let you do social media for your organization. It’s something that every one who has ever engaged in social media had to do, at least once. It’s an important step because you do need some solid buy-in on this new communications strategy. • Loss of control – The reality is engaging in social media is one of the best ways to regain control of your message and brand. With all the social media platforms you get to pick your profile picture and determine how you present yourself to your followers. Jumping into social media and securing your brand’s identity – Twitter ID, Facebook vanity URL, blog name – you can stop others from poaching your name. • Meanies – Okay, here is a little secret…people are already saying mean things about you! And if you are not engaged in social media they are, in essence, saying it behind your back to all your friends. By monitoring your brand and organization in social media you can address these meanies and deal with them on a one-on-one basis. • Time management – Time is the ONLY cost of social media, so value it. It is incredibly important to budget time for this communications tool. Take the time to make a plan about when you will engage, what kind of content you’ll share and how often you’ll interact with your followers/fans. This is a critical consideration to your success. Also remember it doesn’t have to control your life or be a priority over your other communications tactics. Just integrate these tools into all the other great stuff you are already doing. • Social media IS the next business revolution – It’s just like email; some people hoped email would just go away so we could send faxes forever. Well those people lost (thankfully) and now email is part of every successful business. Social media will be the same way in the coming years. If an organization is not engaged in social media they will look dated, out of touch and will be seen as having bad customer service. • Connect with your community – Being part of social media gives your community (AKA your donors, customers, residents, volunteers, etc.) a portal to ask questions, get information and connect with you on their time and in the method that they want to connect. It’s great to drop into Facebook, check up on your sister’s latest adorable kid photo and find out about your favorite organization. Be where your community is and, trust me, they are using social media. • Increase your traffic to your website – Social media is just one more way to leverage all that money you put into that fancy website. You can tease information from your Facebook or Twitter accounts to go to your website to learn more about your programs. • Embrace controversy – If you do deal with a controversial issue it’s even more important for you to have a presence in social media. In my day job I work as Communications Director for the Colorado Children’s Immunization Coalition (CCIC), a pro-vaccine organization. I know controversy first hand. If you are controversial you have so much to say and to defend about your issue. Be brave and jump in the fray, your cause deserves it! For lots more on that check out this blog post. 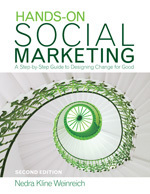 • Get more tasty tidbits for leadership, donors and annual reports – You get so much anecdotal, honest comments, both good and bad, about your organization through your social media connections. Social media allows an organization to make an immediate impact and connect with real people. So incredibly invaluable and incredibly HARD to gather in any other communications tool…tried a survey lately? • Find new people to support your cause for FREE – Yes, I said it FREE. You can target new people and experiment with difference audiences for FREE. Engaging in social media is WAY cheaper than buying a list or attending community events. Just figure out where your audience is and start posting. • Get the attention of key influencers – You can use social media strategically to get introduced to funders, influential organizations and important people. At CCIC, we have been able to elevate our presence beyond Colorado to a national level with lots of targeted Twitter relationships. We’ve gotten the attention of national organizations and the CDC. • Connect with traditional media – You can create real relationship with reporters online. Not only can you send them direct messages with story pitches but they see all the information you spew out then pick and choose on what stories they want to cover. • Attract the elusive blogger – Bloggers are the next newsies. These are influential people who are not going anywhere. Comment on their posts, find their Twitter feeds and get to know them. Form a tight bond and they might even let you submit a guest post. At CCIC, we’ve created relationship and got posts/guest posts on influential blogs including Discover Magazine Blogs and other blogs around the world. • Do something completely new – Use this new environment to experiment. It’s just your time that you are gambling with. We did this really good “feel good” campaign over Thanksgiving which allowed parents to give thanks for their healthy kids – see the results. For more tips on how to get engaged in social media, developing content, saving time and dealing with those meanies, check out my social media presentations. So, are there more fears floating around out there? Is there another way you helped convince your boss to let your engage in social media? I want to hear about it!